The Savē calendar has been full this week! 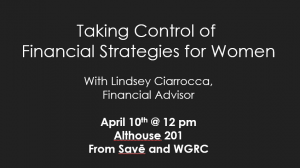 On Tuesday, April 10th, we welcomed local financial adviser Lindsey Ciarrocca, who talked about financial planning considerations for women. Lindsey pointed out the importance of identifying our long-term financial goals so we can take steps now to make goals our reality. 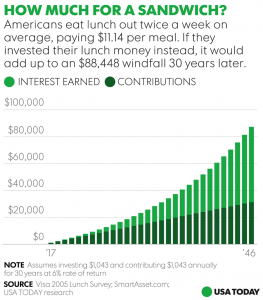 One of my favorite slides from Lindsey’s presentation illustrated the impact eating out for lunch a few times a week can have on our long-term savings goals. 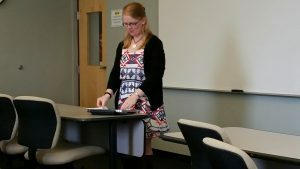 Special thanks to the Women’s & Gender Resource Center for co-sponsoring this fantastic lecture, and thanks to Lindsey for volunteering her time! 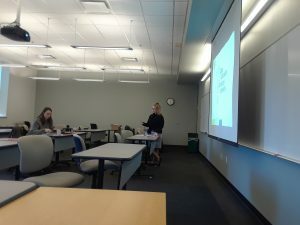 Thursday we hosted a tax workshop which was meant to help attendees feel more confident about preparing their tax returns. 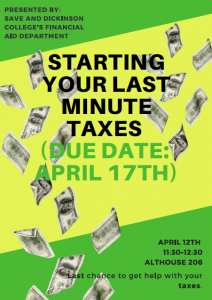 We had three fantastic volunteers from the Money In Your Pocket (VITA) tax preparation program here at Dickinson, and quite a few students stayed for the hour-long workshop. A few of our tax workshop attendees. If you missed this event, you can find the outline we used here. Special thanks to Anna, Fangzhou, and Jordan for their really excellent assistance. We could not have helped so many people without you! 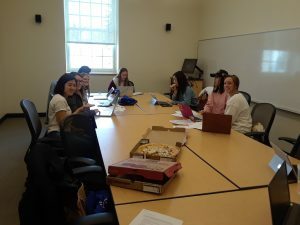 Thursday evening, Rebecca was invited to speak with the Trendsetters, Dickinson’s first-generation student group. We had a lively and engaging discussion on credit & debt, student loans, and budgeting basics. 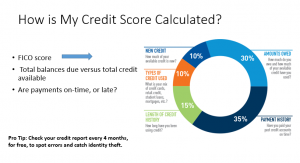 Notes from our presentation on credit scores. 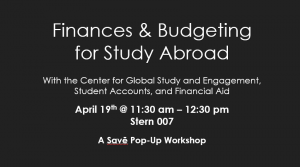 We hope you’ll join us later this month as we focus on preparing finances for studying abroad, and learn how to protect ourselves from a wide variety of scams – and the financial fallout that can result! 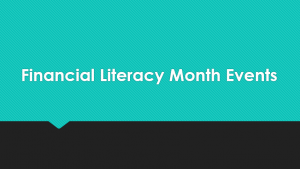 Did you know April is Financial Literacy Month? Yes, the entire month of April. That’s how important this stuff is – it gets its own month. Savē is here to help! 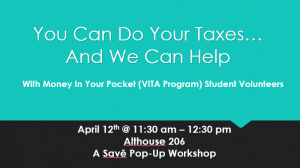 We’re hosting workshops throughout April to help you with everything from taxes to avoiding financial scams. 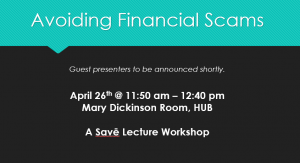 As always, you can schedule a personal budgeting session or ask us to speak at a group meeting at any time by emailing financialliteracy@dickinson.edu. We are looking forward to seeing you this month! 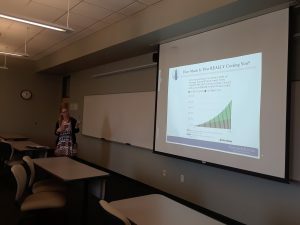 Local finance expert Lindsey Ciarrocca came to campus last Thursday to share some finance basics with interested students. 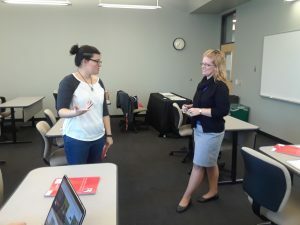 Lindsey talked about the importance of having financial goals and plans – even as early as your time in college! 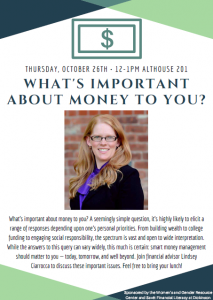 Using a pyramid of financial needs – which psychology students would recognize as akin to Maslow’s Heirarchy of Needs – Lindsey helped us to consider the bottom level of financial wellness. Attendees inventoried some personal short- and long-term goals, and were challenged to consider what they hope retirement will look like. 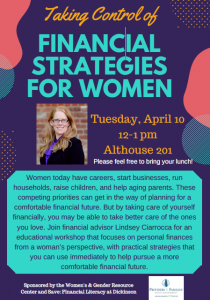 We talked about the way a budget can help us reach financial goals, and learned why it is important to create an emergency fund. 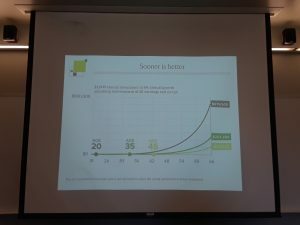 “Sooner is better” – Illustrating the wonder of compounding interest and the importance of early retirement contributions. Many thanks to Lindsey for volunteering her time, and thanks to Dickinson’s Women’s & Gender Resource Center for co-sponsoring the event.